Shake it to create rumbling, thundering sounds. Shake it more vigorously to change the sound. Long spring makes the drum skin vibrate. Vibrations travels through the acoustic body to create the sound of rolling thunder. NEW - LATIN PERCUSSION ASPIRE WHITE WOOD CLAVE. Both clave (male) and striker (female) are 8" long by 1-1/2" wide. Other alphabets (Cyrillic, Japanese, Chinese, etc.) will not be translated and your item will be delayed. We have over 200 drum sets on display, 100's of cymbals, tons of hardware and 1000's of parts all under one roof in three huge showrooms. But if you have an old 6mm boom arm or stand this is a great way to convert it to a percussion holder too. Finger-sized version of the LP One Shot shaker. Other alphabets (Cyrillic, Japanese, Chinese, etc.) will not be translated and your item will be delayed. We do not accept wire transfers. FOUR PAIRS OF STAINLESS STEEL JINGLES - held in place and provide a bright, shimmering accent that blends perfectly with the volume of a cajon, djembe, bongos, or congas EASY TO TAKE ON AND OFF - With the jingles mounted facing up, a tap of the foot releases a dynamic sound from light taps to resounding accents, even while sitting down DURABLE ELASTIC BAND - Simply slip the durable elastic band on your shoe, and the tambourine is secure safety to your foot. It's ABS plastic body is specially Congou White so that it's comfortable to wear during performances PERFECT FOR GUITARISTS AND SINGER/SONGWRITERS - Not just for timekeepers, guitarists, and singer/songwriters will find this accessory extremely useful in their playing. 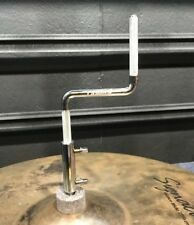 The foot tambourine percussion has a half moon design to fit over the bridge of the foot and is made from durable ABS plastic to withstand regular use. 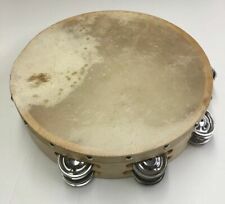 Our Small foot tambourine is ideal for guitar players, musicians, singers, dancers, music classes, bands, gigging, recording studio and much more. Please review the full item description of item "A-Star Mixed Fruit Shakers" for all information regarding delivery and technical specifications. Maracas, LP281 Pro Maracas Matched Pair. LP Pro Maracas are the most imitated maracas around. 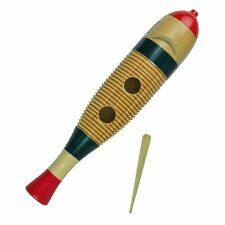 This variation in pitch is the way maracas were historically designed to produce the classic maraca sound. This is a fun and unique "Kalimba" Thumb Piano from Africa. This Kalimba is derived from the more complex South African Mbira, and is played by plucking the keys with the thumbs of each hand while holding the gourd body in your palms. 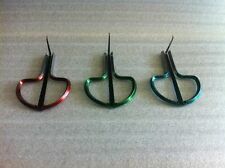 Hand Made and Painted Bamboo Jews Harp. 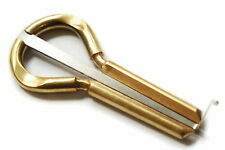 Alovely hand made and painted bamboo Jews Harp. Material: Mahogany. 17 diatonic keys (C4 - E6). It’s not just about videos and know how; it’s about the person on the other end of the line. We're musicians just like you. Resonating box with sound hole on front and back board. Brand New Tamborines. A three (3) piece set 6”, 8”, and 10” of Single Row Of jingles. Great sound. Easy play and lightweight. Set de tres(3) Panderetas para toda la familia de 6”, 8”, y 10”. Liviana, Fácil de manejar y De buen sonido. Tipo de panderetas usado en las Iglesias. SPECIAL NOTE: THE WHITE AREAS ON THE MARACAS IS A REFLECTION OF LIGHT, NOT AN IMPERFECTION. THE MARACAS ARE IN PRISTINE CONDITION. Pair of Professional Maracas CP made of leather with the painted design of the Cuban Flag. White Wood Claves 18cm By The Celticland. Designed By The Celticland. Nicely Crafted. Specially prepared rawhide shells filled with pellet material ensure the tone to be crisp and cutting. The raw-hide shells are secured firmly to wood handles. A nice Blue carry bag bearing the LP logo is included. Maracas Salsa Pan Con Queso Profesional. Condition is New. Shipped with USPS Priority Mail. Made in 2017 in Venezuela Caracas. Those marcas do to the fact that were made in 2017 have a much better sound than the 2019 because it’s skin is completely dry and the seeds are too. USA SELLER . Compre con confianza Se habla español. NEW - LP CLASSIC ROCK RIDGE RIDER COWBELL. The high pitch and bright sound cuts through in a live situation while the moderate overtone is perfect for recording. Other alphabets (Cyrillic, Japanese, Chinese, etc.) will not be translated and your item will be delayed. 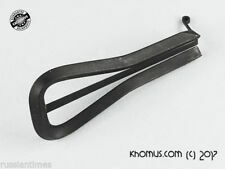 Cowbell is approximate size 2” wide at the mouth and 6-1/2" in length. Includes wooden play stick and Cowbell pouch. Made in Colombia. See Photos. 17 Keys,3 Sound Holes Soft Bag,Woodman 1314 Solid Wood Kalimba MBIRA Thumb Piano. You could play songs easily by pulling keys. A simple operation can learn a minute. Triple sound holes leading clean and clear sound. Create jingle patterns by playing the high-hat pedal. Features convenient wing screw tightening. Perfect for your Luau party, childrens party or any other party. Colors may be different than pictured. NEW - LP DUOSHAKE - SOFT. An addition to LP’s legendary Soft Shake, this set of two small plastic shakers with soft weight shot, connected by two rubber bands, is great for most musical situations. Remove the rubber bands and you have two individual shakers. We have over 200 drum sets on display, 100's of cymbals, tons of hardware and 1000's of parts all under one roof in three huge showrooms. Clamp is constructed of 3/16" thick steel. Very sturdy. Any cymbals, bells, or jam blocks shown are available but not included. 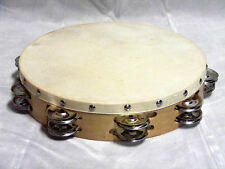 10" Reflective Double Row Jingle Tambourine. Fuses & Fuse Holders. Car Alarm System. Remote, Primary Wire. Adult Only. CCTV Security Accessories. Marine Wire. Power Wire & Amp Kits. 5d2 Salsa Maracas 10" Black With Wood Handles. 5d2 Maracas are the most imitated maracas designed to produce the classic maraca sound. Maracas 5d2 (Cinco Dedos) de 10" de largo, producen el Classico sonido para tocar musica de Salsa y otros generos. Maracon Maracas typical of Colombia to play Cumbia Music. 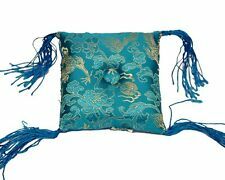 Made by Colombian craftsmen. Sound is crisp loud and cutting. Approximately 10-1/2” long and 5” round. Photo is a representation of item you will get. Each one is individual and unique. Maracones Gaiteros típico de Colombia hecho a mano por Artesanos en Colombia. Fabricado de totumo natural con perlitas adentro. El sonido es típico de este instrumento. Las fotos son una representación del producto que recibirá. Cada uno es único. This pair of hardwood claves by Hohner have a bright sound with great tone that is ideal for all applications. These are available at a great price that is hard to pass up. Hand Made and Painted Ocean Drum. A lovely small Ocean Drum. They are filled with seeds, and as you move them gently around, the recreate the sound of waves on a shingle beach. 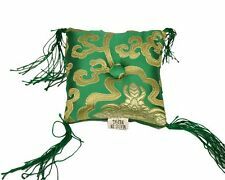 These are grand things, hand made and painted with a bound rope handle, and very easy to use. Original LP Vibra Slap. 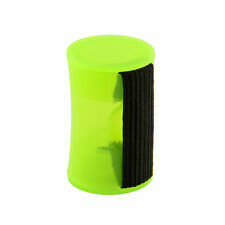 - Sound can be varied simply by rotating the sound chamber. NEW YELLOW DELUXE PAIR OF RYTHM PERCUSSION EGG SHAKERS!!! 1 Pair Plastic Percussion Musical Egg Maracas Shakers. These egg maracas will give little ones hours of fun and will encourage toddlers' musical activities. 2 x egg maraca. Sold as one pair. Perfect for an early learning toy, toddler rhythm work, or classroom music. We have over 200 drum sets on display, 100's of cymbals, tons of hardware and 1000's of parts all under one roof in three huge showrooms. Cymbal boom stand not included. Cymbal felts, washers, and sleeves included. Hecha a mano en República Dominicana. Mide 10" X 3". Este tamaño da un Tono mas alto que la Guira regular. No es una guira profesional, pero muy buena para aprender y tocar con los amigos. Gancho esta incluido. Scraper included. Hecha a mano en República Dominicana. Mide 12” X 5”. No es una guira profesional, pero muy buena para aprender y tocar con los amigos pegando el golpe. Gancho esta incluido. Vea los retratos. Each tambourine discs create a wonderful sound with every hit of the tambourine. This LED Tambourine makes it a great toy for them. LIGHTS AND MUSIC: Play music with this Hand Tambourine and enjoy the flashing colors at every beat you make. 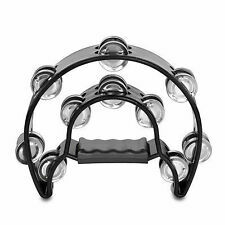 Coda Double Row Jingles Half Moon Tambourine -Black. This Coda tambourine features two rows of jingles and an ergonomic handle. No Slip Hand Grip. 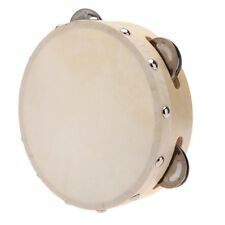 This Mini Half Moon tambourine has four single row of jingles, (8 total) that will cut through any choir or music ensemble. Mini Half Moon Tambourine. Its smaller size for kids makes for easy handling. The plastic half-moon shape features 10 jingles. It is a full size and also features a comfort grip. 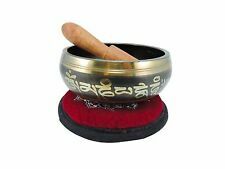 This Tambourine makes a great gift and can been used in a variety of settings, including Karaoke, classrooms, bands, and orchestras!